Going by what I’ve been sent so far, I imagine most of the scores that I’ll be posting in the CNP are going to be pretty idiosyncratic in one way or another. (Seriously – stick around.) Chris Opperman writes from a more conventional place, at least notationally speaking. But we like to be reasonably non-partisan here, so Chris’s submission is very welcome. Besides, it would be strange to ignore the role of high quality DTP publishing and the continuing role of more or less standard notational practices in contemporary music making. Kagemusha is a tone poem based on Akira Kurosawa’s 1980 film, and has recently received its world premiere from the Berklee College of Music Symphonic Winds, conducted by Dominick Ferrara. Its extended triadic harmony, groove-based rhythms and stratified orchestration sit in that zone between Stravinsky and rocky postminimalism characteristic of a lot of today’s music. To celebrate the Rambler’s arrival on Facebook I am launching a new feature: the Contemporary Notation Project. The idea is simple: the Facebook page needs a nice header image; lots of new scores look simply divine. Why not combine the two? 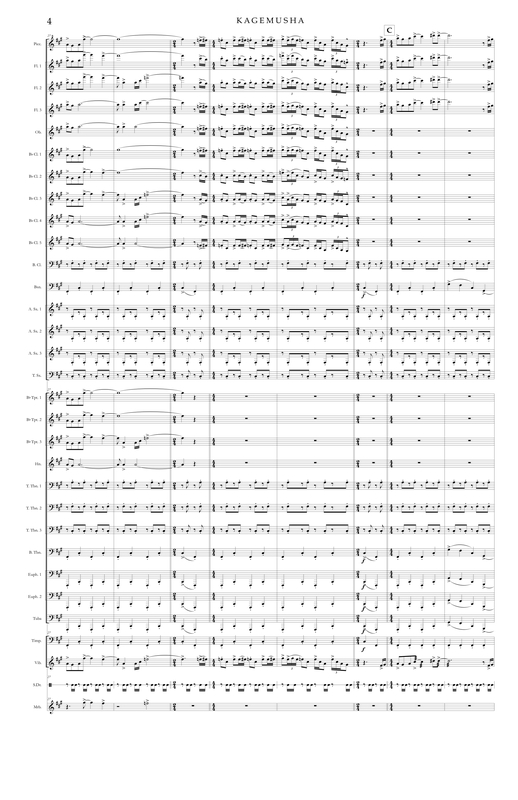 So each month I’ll be posting a snippet from a contemporary score that has caught my eye, accompanied by a short post here explaining what it is, who it’s by, and a little of what I like about it. explores interaction based on a player’s perception of others, their own and their instrument’s actions whilst simultaneously examining the physicality and individuality of human performance. hush is one of several recent pieces in which this exploration takes the form of extremely tenuous sounding activities. That is, performance actions that only just, if even that, produce audible results. In hush, these include instructions to bow the cello at various distances above the string, for example. 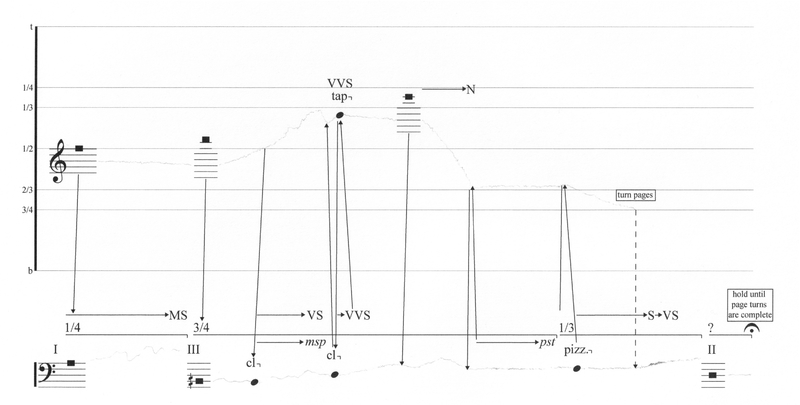 At a greater distance there is no sound at all, but just above the string the player’s trembling musculature comes into play, and accidental contact is occasionally made. Similar processes are at work in the harp, which is mostly bowed using a wooden drumstick. This imprecision is communicated by hand-drawn lines on the score which are themselves written with the pen just above the page and subject to similar physical fluctuations. I find that quite a lovely way of using notation to bring composer and performer closer together. Notation that directly traces the required result. Update: I’ve just received word that hush is receiving its world premiere next Tuesday at the Royal College of Music. Details here. Concert also includes pieces by Jonathan Cole, Joanna Sy, Nicholas Moroz and others. P.S. If you too book your face then please visit our page. As well as images from the Contemporary Notation Project, there are links, videos, shares etc that won’t make it to the main page. If you’re a composer who would like your music to feature in the Contemporary Notation Project then please get in touch through Facebook, Twitter or email.